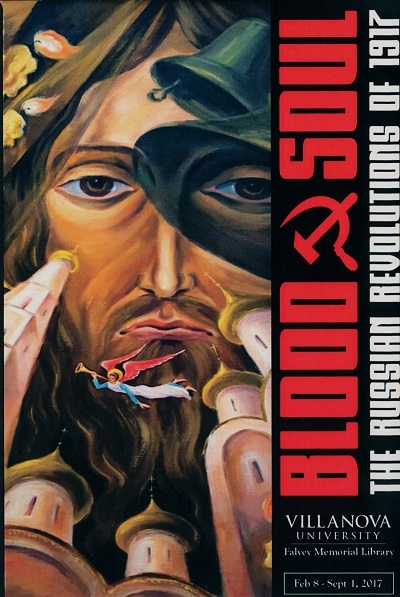 The exhibit, “Blood and Soul: The Russian Revolutions of 1917,” opens today with a 5 pm reception in Falvey Memorial Library. Archpriest John J. Perich, curator of the Metropolitan Museum of the Orthodox Church in America, and the Rev. Richard G. Cannuli, OSA, curator of the University Art Gallery, co-curated and mounted the exhibit which remains open through Sept. 1. The exhibit commemorates the one hundredth anniversaries of the Russian Revolutions and the enthronement of St. Patriarch Tikon of Moscow. Preceding the opening of the exhibit, at 4 pm in Corr Hall Chapel there will be a memorial service for the victims of the Russian Revolutions.